Ramapala was the last of the Pala emperors and he was overthrown by the rise of the Senas, who were kshatriyas from Karnataka. The foremost kings of this dynasty, which can be said to have come from the Chalukya royal family of Karnataka, were Vijayasena and Lakshmanasena. The Senas greatly valued Sanatana Dharma as well as the spirit of kshaatra. They also encouraged the arts and literature. Umapatidhara, Sharana, Govardhana, Shrutidhara, Dhoyi, Vatudasa, Sridharadasa, Halayudha, and other Sanskrit poets flourished under the nourishment of the Senas. In fact, Lakshmanasena and his father, Ballalasena were themselves Sanskrit poets and pundits. Ballalasena was also an expert on the dharmashastras. He wrote works like Danasagara and Adbhutasagara. Lakshmanasena's poems have been included in Sridharadasa's Saduktikarnamruta. In this anthology, there are several other beautiful poems by numerous Sanskrit poets. All these eminent people prospered under the benevolent rule of the Palas and Senas. Among the available compositions from this era, perhaps the greatest and pioneering work was that of Jayadeva. His magnum-opus, Gita Govinda was the model for the music and literature of post-classical India. In the classical period, Kalidasa's poems and plays offered a model and an inspiration for music, dance, sculpture, and the Sanatana Dharma culture; similarly, in the period of Islamic invasion and barbarism, Jayadeva's work became a rallying point for music, dance, painting, sculpture, bhakti, and worship, providing a model for and inspiring those fields. Specifically, through its madhura-bhakti, the Gita Govinda became a treasure trove for the devotional compositions of generations of sadhus and saints. Jayadeva's compositions have made their way into the Guru Granth Sahib of the Sikhs, thus giving the necessary emotional richness to that great warrior-tradition. Not only that, when India was reeling under the bigotry of Islam that resulted in the destruction of the temple culture, primarily the Kathashilpas (narrative sculptures) and Bhavashilpas (emotional sculptures) were destroyed. Jayadeva's Gita Govinda gave the inspiration to revive the Indian painting tradition, which in turn helped fill the void created by the barbaric iconoclasm of Islam. Gita Govinda was responsible in preserving the ethos of our gods and goddesses, puranic lore, nature-culture oneness, and their myriad manifestations and transmitting them to the common people. Kangda, Pahadi, Mewadi, Madhubani, Dakkhani, Patachitra, Rajaputhani, and numerous other schools of classical art have been inspired by the Gita Govinda and have taken the concepts of Nayaka-Nayaki bhava and Raga-Ragini bhava, as well as the stories of Rama, Krishna, Shiva, and Shakti. During that miserable period when there was no opportunity for the creation of the sthavara (static) – i.e. temples built with a great deal of effort, time, wealth, and expertise, Sanatana Dharma stood its ground in the hearts of the people through the jangama (dynamic) – i.e. paintings and drawings that take lesser effort, time, and wealth. The credit to this goes in great part to the Gita Govinda. And what formed as a nourishing ground for this great endeavour was the preeminence given to kshaatra by the Senas. Lakshmanasena faced the onslaught of the barbarian Mohammed Bhaktiyar Khilji using strength and tact, thus preventing the conversion of the people of Bihar and Bengal to Islam. In this matter, the Islamic chronicles blatantly lie when they claim that Lakshmanasena escaped from war. However, it is true that Bhaktiyar Khilji’s journey of annihilation crushed under its ruthlessness the Buddhist universities of Vikramashila, Odantapuri, and Nalanda apart from numerous Hindu temples. Lakshmanasena’s son Keshavasena too fought against Islamic assaults. Several Islamic invaders such as Malik Saifuddin fought against him and died at his hands. In sum, the Senas gave importance to the Shaiva-Vaishnava-Shaakta schools and balanced Braahma and Kshaatra to the best of their abilities. After the decline of the Pratiharas, North India was largely ruled by several Rajputs who lived in neighbouring regions and ruled their own small kingdoms. Among these, the pre-eminent ones include Chandelas, Paramaras, Chahamanas, Gurjarachalukyas, and Mewadi Guhilas. An acquaintance with a few of them becomes essential when seen through the lens of the Indian spirit of kshaatra. One of these great royal dynasties is the Chandelas of Bundelkhand. The Chandelas who ruled Bundelkhand having Kalinjar as their capital, were originally Shudras. They became Karma-Kshatriyas solely on the strength of their valour. Among the Chandelas, Harshaputra Yashovarman has distinguished himself on the merit of his achievements. This warrior triumphed over Siyaka of the Paramaras, Vigrahapala of the Palas, and the crown prince of the Kalachuris. 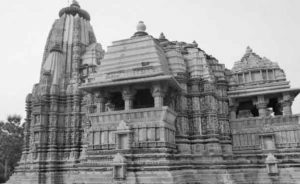 The vast temple complex in Kharjuravataha or Khajuraho together with the Chaturbhujanarayana temple stand as testimonies to how valour and piety and artistic feeling stood shoulder-to-shoulder in this king. His son Dhanga (950—1004 CE) is the greatest Chandela king. He extended the sway of his Empire and became an emperor of the stature of the Gurjara-Pratiharas. He is the self-respecting Sanatani who courageously stood up to Subaktigin and Mahmud of Ghazni. 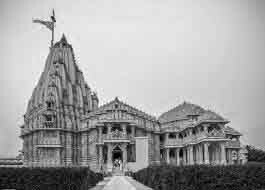 The credit for completing the temples that his father Yashovarman began goes entirely to Dhanga. His grandson Vidyadhara gave battle to Mahmud of Ghazni but couldn’t emerge victorious. He made a treaty with him and lost enormous wealth as a consequence. In spite of this, his suzerainty remained unthreatened. Of the Chandelas who succeeded him, Paramardhi (1165-1202 CE) distinguished himself as a commander of immense gallantry. Unfortunately, he was defeated in Qutubuddin Aibak’s raid and had to accept a humiliating treaty. Infuriated that this humiliation had occurred under the watch of such a king, Paramardhi’s own minister, Ajaya Deva murdered his monarch! Later, Paramardhi’s son, Trailokyamalla declared war on Qutubuddin, defeated him on the battlefield, and wrested back Kalinjar, the capital city of his dynasty. This is among the countless such examples of how such kings displayed their glorious spirt of Kshatra. In later periods, although the Chandelas managed to secure their dominions, they had to throw up their hands, helpless in face of the repeated and barbaric onslaughts of Islam. Most notably, the glorious legacy of the Chandelas who resolutely upheld Sanatana Dharma inspired warrior-rulers like Chhatrasala who emerged much later. This is the eternal, noble contribution of the Chandelas to this country. The Chauhans were the most extensive among all of medieval India’s Rajput dynasties. They were also known as Chahamanas. They arose in the Rajaputana regions of Shakambari, Ranathambhor, Nadol, and Jalor between the tenth and thirteen centuries and gradually spread out, and were engaged in constant battle with Muslim rulers. The Shakambari branch was the most significant of these. The extraordinary prowess of Durlabharaja I is absolutely praiseworthy. As the vassal of the Pratihara king Vatsaraja, he had participated in an expedition against Dharmapala. Durlabha’s son, Govindaraja I stood in support of the Pratihara king Nagabhata II and helped vanquish the Arabs in the Sindh region. Another ruler who emerged from this same tradition, Vakpatiraja’s son Simharaja eventually earned the title of “Maharajadhiraja” (King of Kings). By this period, the Empire of the Chahamanas had encompassed both the Eastern and Northern reaches of today’s Rajasthan. Ajayaraja, the king hailing from that dynasty is the founder of today’s Ajmer city (or Ajayameru). Vigraharaja who succeeded him won the Delhi-Punjab regions and earned renown after beating back Islamic invasions several times. The last great name hailing from this dynasty is Prithviraj Chauhan III. Although his valour was truly incredible, he had to eventually perish at the hands of Mohammad Ghori’s skullduggery because of a lack of strategic thinking and keen insight. Prithviraj III’s son, Govinda was the founder of the Ranathambhor branch of the dynasty. Another notable king after Govinda was Veeranarayana, who successfully overcame Islamic raids. However, he was invited to Delhi by the despicable Iltamush who in the guise of honouring him had him murdered in stealth and annexed Ranathambhor. However, Veeranarayana’s maternal relative, Vagbhata is the famed warrior who chased Iltamush away and wrested Ranathambhor back. 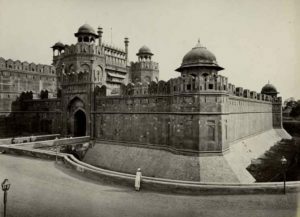 Between 1248-1253 CE, every single contingent that the Delhi Sultan dispatched to Ranathambhor was decisively defeated and crushed. Jaitrasimha, the son of Vagbhata epitomized the brilliance of Kshatra like his father. Even he had triumphed over Islamic raids and held his head high. His son is the renowned and the supreme warrior, Raja Hammira. In him we see the excellent blend of Brahma and Kshatra and it was he who successfully conducted the Koti-Yajna, among other Vedic rituals. He fought Jalaluddin Khalji with fierce valour. However, around 1300 CE, thanks to the wretched machinations of the crooked king Alauddin Khalji, his own trusted aides like Bhoja, Ratipala, and Jayamalla emerged as traitors. The independence of Ranathambhor stood terminally threatened. Alauddin Khalji not only lusted after Hammira’s daughter, Devala Devi, he also proposed extremely degrading terms for a treaty. The entire Rajput clan was struck with revulsion at this depraved character of Alauddin that they chose to fight to death. Accordingly, they gave a heroic call to all the women of Sanatana Dharma to commit Jauhar while they surged forth and fought this Sultan with unparalleled heroism on the battlefield and attained the proverbial Viraswarga [literally, Heaven of Valour]. And so, with the death of the self-respecting and heroic Hammira, that branch of the Chahamana lineage was extinguished. Ashwapala’s son, Anhila is the greatest ruler belonging to the Nadol branch of the Chahamanas. Not only did he defeat Paramara Bhoja and Bhimadeva of Gujarat, he also successfully faced multiple Islamic incursions and beat them back. However, it is a matter of tragedy that this dynasty met its closure in a raid unleashed by Qutubuddin Aibak. Among the rulers of the Jalor branch of the Chahamanas, the most exemplary name is that of Kirtipala. Although he was a very devout adherent of Sanatana Dharma, he also made bestowed generous patronage to Jainism and other Dharmic sects. Equally, his son Samarasimha earned prestige and goodwill by building temples, instilling awareness about Dharma, spreading knowledge and for his large-hearted generosity. This apart, being a shrewd practitioner of statecraft, he built impenetrable forts and cities. His period witnessed an era of great peace and prosperity. His son Udayasimha, was a worthy successor. Not only did he extend the frontiers of his kingdom, he also faced Iltamush’s attacks. Although he lost against the latter’s superior strategy, he earned respect for his valour. However, Iltamush didn’t stop there. His innate Hindu hatred made him attack and besiege the Gujarat Vaghela king, Viradhavala. Unable to tolerate this, Udayasimha rushed to Viradhavala’s assistance and repelled this Muslim incursion. His military prowess was matched by his love for art, both worthy of our admiration. Indeed, it is a matter of great lament that this distinguished lineage had to finally meet its demise at the hands of Alauddin Khalji’s bigoted aggression. The Gurjara-Chaulukas (or Chalukyas) are famous as Solankis. Although Bhimadeva (1022-1034 CE) is extremely renowned, he ran away to the safe haven of the Kutch region like a coward when Mahmud Ghazni attacked Somanath, thus leaving a disreputable scar on the spirit of Kshatra. Not just that. This foolish king repeatedly attempted to destroy exemplary heroes and leading lights of Sanatana Dharma like Paramara Bhoja and Kalachuri Karna. Fortunately, Jayasimha (1094-1144 CE) not only blazed the glory of Kshatra, he also vanquished the Arabs in Sindh and stood solid guard in defence of Sanatana Dharma. He constantly expanded his dominions and built numerous tanks, wells, ponds and temples. He upheld the value and prestige of the Brahma-Kshatra amalgam. But here is a tragic irony: his successor was a close relative named Kumarapala who came under the spell of Hemachandrasuri and embraced Jainism. He accepted the Nivrttidharma or renunciation from worldly matters and thereby ebbed the spirit of Kshatra. And so, the Solanki Empire slackened after his death. Govindachandra was the most capable ruler belonging to the Gadhwal dynasty which ruled from Kanyakubja-Varnasi. Not only had he won numerous wars, he also had an abiding interest in the arts. The Krityakalpataru authored by his minister, Lakshmidhara is an encyclopedia in the field of the Dharmashastras. His eldest son, Vijayachandra had fought against an Islamic invader named Khusrav Khan and won decisively. The infamous Jayachandra (or Jaichand) was his son. However, recent research reveals that Jaichand didn’t actually betray Prithviraj Chauhan; on the contrary, he too fought against Mohammad Ghori and died in battle. He extended patronage to renowned poets and pandits like Sriharsha. The numerous Shiva-Keshava temples built by a host of kings belonging to this dynasty have been completely annihilated at the hands of Islamic religious fanatics. The Paramaras of Malwa are Rajputs as well. The most prominent among these include Munja and his younger brother’s son, Bhoja. Bhoja’s father, Sindhula was also a valorous king. Like Bhoja, even Munja was a great patron of poets and scholars. Bhoja, the unalloyed adherent of Sanatana Dharma built great temples in numbers equaling the works he authored. He was the wheel that fused the chariot of the unity of Brahma and Kshatra. The Guhilots [the contemporary spelling is Gehlot] who ruled the Rajasthan, Punjab, and Kathiawad regions originated primarily from the Mewad area. They are also variously known as Guhilaputras, Gobhilaputras and Guhagotras. They originally descended from a Brahmana lineage and eventually earned a place of honour in the 36 prominent Rajput dynasties. This glorious dynasty gave birth to such towering Kshatriya titans like Bappa Rawal, Ratna Simha, Rana Kumbha, Rana Sangramasimha and Maharana Pratapa Simha. Eminences like Rana Kumbha had attained equal excellence in wielding both scholarship and the arms. Without exception, every single ruler of this dynasty had been born with a sacred vow to defend Sanatana Dharma and to end the depredations of Islam. And when we recall the fact that the saint par excellence Mirabai was born in this Guhila dynasty, we won’t remain untouched by the majestic accomplishments of this dynasty.